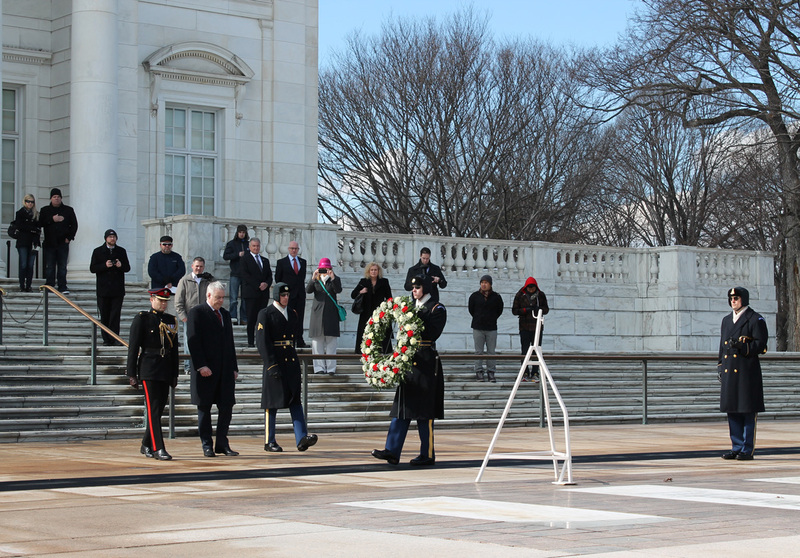 As part of his visit to the United States this week, the First Minister of Wales, Carwyn Jones, has laid a wreath on behalf of the people of Wales at the tomb of the Unknown Soldier in Arlington National Cemetery, Virginia. The tomb is dedicated to American armed service personnel who died on active service without their remains being recovered or identified. Unknown soldiers from the First World War, Second World War and Korean War are buried in the tomb – the first of whom, a First World War American soldier, was interred there in 1921. “Wales and the United States both have proud histories of armed service. We owe our armed forces and veterans an immense debt of gratitude and it’s therefore an honour to come to Arlington and pay my respects at the tomb of the Unknown Soldier. “It’s particularly appropriate to do so in the year when we commemorate the centenary of the beginning of the First World War. Cymru’n Cofio Wales Remembers 1914-1918 was launched by the First Minister last year, when he announced £850,000 towards supporting the educational legacy of the commemoration of the conflict. The Welsh Government is also committed to contributing money to the construction of a new First World War memorial in Belgium to remember all the people from Wales who took part in the war and to the revamp of an existing memorial in France. Arlington National Cemetery is the final resting place for more than 400,000 United States military personnel – who died whilst serving or when retired, plus members of their families – and currently covers 624 acres. The cemetery also has Welsh links. 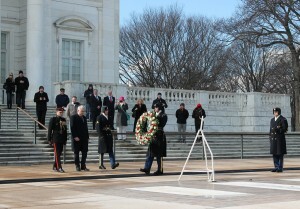 On 8 March 2013, the remains of two crewmen recovered from the wreck of the USS Monitor, a US civil war-era warship, were buried in Arlington. Although researchers were unable to confirm the exact identities of the two men, one is believed to be Welsh-born sailor Robert Williams, who was born in Wales in 1832 and later emigrated to the United States.